This information page will concentrate on number one (POAG) and two (AACG) in this list as these are the two forms which represent the vast majority of cases found in the UK. Glaucoma is a major cause of sight loss in the UK and around the world, responsible for about 12% of all blind registrations in the UK. This is an unfortunate statistic because the majority of cases can be easily treated with simple eye drops, all it takes is a short eye pressure test to rule out the disease. If undetected it often causes significant sight loss before the patient is aware of any problems, so frequent eye examinations at the Optometrist are vital in the battle against this disease. About 2% of people over the age of 40 suffer with glaucoma in one form or another and this increases to 10% of the population in the UK over 70 years of age. Family history is an aggravating factor as those with a parent suffering with glaucoma have a increase in risk of 4% and those with a sibling have a 10% increase in risk. Currently the NHS in England covers the cost of an annual eye examination for those with a immediate family member suffering with the disease in an effort to catch the disease development as soon as possible. Different racial groups are also at higher risk of developing the disease with Afro-Caribbean heritage being the most at risk group. Those who have a hyperopic prescription (long-sighted) are also more susceptible. This is due to the eye being smaller (See refraction) and, therefore, having less room to accommodate all the internal ocular structures resulting in a more compact eye and subsequently more risk of an increase in pressure with small changes in Aqueous production and or drainage. Manipulating the Intra-ocular pressure by medication and or surgical intervention is the method of treatment of all glaucoma. It is, therefore, important to understand what is a normal IOP. Some would argue that this is a whole degree subject in itself, however, for all intents and purposes a "normal" IOP should be between 6 and 21mmHg, any higher or lower could mean there is a problem with your eyes which needs investigating further. The pressure is taken using either an NCT (Non-Contact tonometer - the puff of air machine) or an applanation tonometer which is more accurate but more time consuming as anesthetic eye drops are needed becasue a small probe gently taps the surface of the eye. We would only perform the second method if we were concerned about the condition of a persons eyes. The pressure of the eyes is very variable and can even be influenced by the testing procedure itself. A person who is quite anxious about the puff of air test can give artificially high readings due to the squeezing action of the eyelids, this is known as white coat syndrome. All this serves to demonstrate how complicated the ocular system is. Just because the pressure of your eye is high or low at a particular time does not definitively mean that you have a problem. Raised IOP does not have any symptoms until it reaches the 30mmHg mark or higher (see ACCG below), therefore patients suffering with Glaucoma are often completely unaware of it's presence. For that reason we cannot stress enough the importance of regular eye examinations to monitor this fluctuation, particularly if you have a family history of the disease. The eye pressure is still not the complete story as there are people who exhibit what is thought to be a normal eye pressure and yet still show optic nerve degeneration in line with Glaucoma, this is termed Low Tension Glaucoma. Vica-versa there are also people who exhibit a high IOP but show no evidence of optic nerve degeneration, this condition is termed Ocular Hypertension or OHT and needs to be monitored carefully as it can develop into glaucoma over time. Yet more evidence to convince you that regular eye examinations are necessary. The field of vision test is very important in both detecting the presence of glaucoma, ie if any damage to the nerve and therefore, the visual field, has occurred and also in monitoring the disease to ensure any treatment is successful. The visual field is the area with which you view the world. Although we use the central area of our visual field to focus on things and view detail there is a significant area which we can see "out of the corner of our eyes" but has less detailed information for us. It is the peripheral visual field that is affected first in glaucoma. Due to the structure of the optic nerve the damage occurs in the peripheral visual field first and due to it's less detailed vision we cannot discern these subtle changes ourselves. It takes a special test called the visual field test to pick up any field loss caused by damage to the optic nerve. The visual field test is machine that presents different coloured lights or patterns before the eyes and requires a response by the subject to affirm that they can see this stimulus. The machine then varies the position and brightness of the stimulus to discern the sensitivity of the retina in different areas. 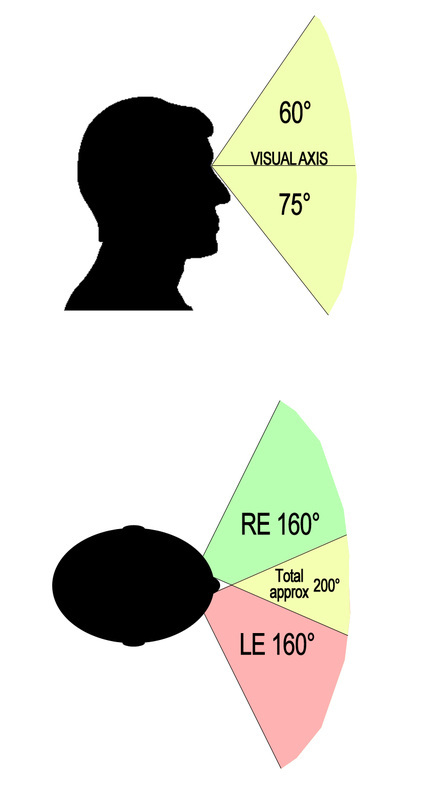 The full human visual field extends approximately 200 degrees horizontally and 135 degrees vertically. The image on the left above is that of a full visual field plot (normal). The greyscales represent how bright the stimulus has to be for the subject to see it (white meaning the light is very dim ie good eye sensitivity and black meaning the eye cannot detect light in that area). 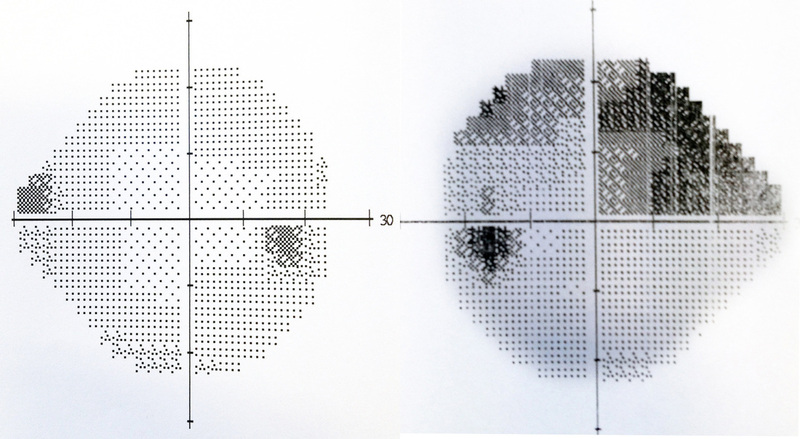 The grey/black dot on the right is the natural blind spot of the eye and the sensitivity of the eye naturally diminishes further out from the centre (the grey gets greyer peripherally) The image above and on the right is that of a typical Glaucoma field plot where the eye has lost sensitivity above the mid line of the line of sight. Again the black dot on the left is the eyes natural blind spot but the dark areas above and to the right are parts of the retina that cannot signal to the brain their messages due to optic nerve loss or damage. Primary open angle Glaucoma accounts for over 90% of the cases of Glaucoma seen in practice. It is defined as a raised pressure within the eye usually caused by a slow clogging of the drainage mechanisms in the anterior chamber. There are no symptoms and once diagnosed it is a chronic life long condition and is usually treated using eye drops although in more unstable cases surgical options are available. These include using a laser to create a small hole in the iris designed to relieve the pressure of fluid flowing through the pupil and inserting an artificial drainage tube into the white part of the eye. Regular monitoring is essential in any Glaucoma cases, and for these in the immediate family also. We currently operate a Glaucoma Virtual Clinic in conjunction with the Victoria Hospital for discharged patients. See the Glaucoma Assessment page for more details. Here you can see that the angle formed by the cornea and the iris is open creating a nice drainage area for the aqueous humor. However, in POAG the angle becomes blocked and cannot drain the fluid quickly enough. 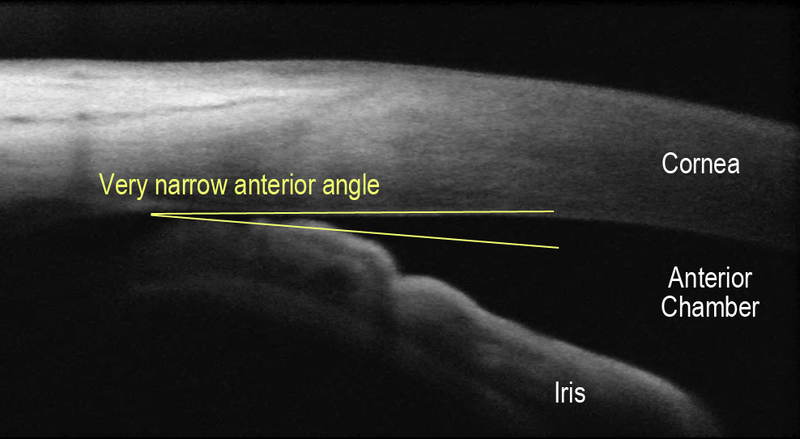 Here you can see that the anterior angle is very narrow. As the pupil dilates the iris can bunch up, similar to a closed curtain and block the angle completely. This causes a rapid rise in IOP. Acute angle closure Glaucoma differs from POAG as it is a rapid onset and very painful condition, it very unlikely to affect both eyes at the same time.. The pain is such that it can cause nausea and the eye is usually very sensitive to light so much so that patients often feel the need to wear dark glasses or close the eye affected. Patients sometimes describe seeing halos around lights also.The eye will be very red especially around the edge of the iris and the cornea can look cloudy. 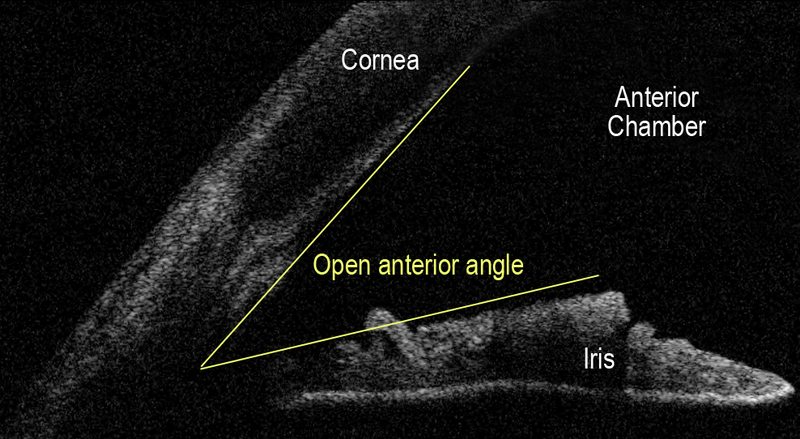 In ACCG the angle between the corea and the iris collapses completley blocking off the drainage mechanisms of the eye. This then leads to a rapid build up of pressure which can cause swelling and acute pain. In most cases the pressure rises to over 30mmHg and is often over 50mmHg (normal being under 21mmHg). This condition needs URGENT medical attention to reduce the pressure and open the angle, usually using a laser to punch a hole in the iris. Due to the high pressures involved if left for more than a few hours the optic nerve can be significantly and irreversibly damaged leading to visual impairment. 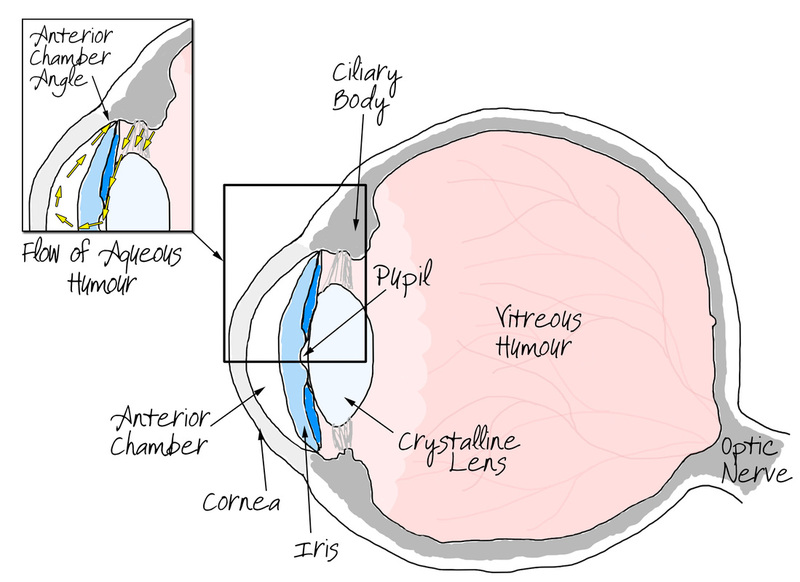 Anecdotally the condition can be caused by a large dilation of the iris as it crumples up much like a closed curtain. In a narrow angle this is enough to completely block the angle causing a rapid rise in IOP. This is often whilst the patient has spent time in a dark environment. It has been known that people suffer from this condition, if they are predisposed to it by having a narrow anterior chamber angle, after visiting the cinema or the theatre. If you are at all concerned please about anything in this article please contact the practice so that one of our Optometrists can advise you of the best course of action. See the section on Emergency Eyecare for more information on how we can help.